So let’s see if we can get the whole day in on one post rather than spreading it out over several. 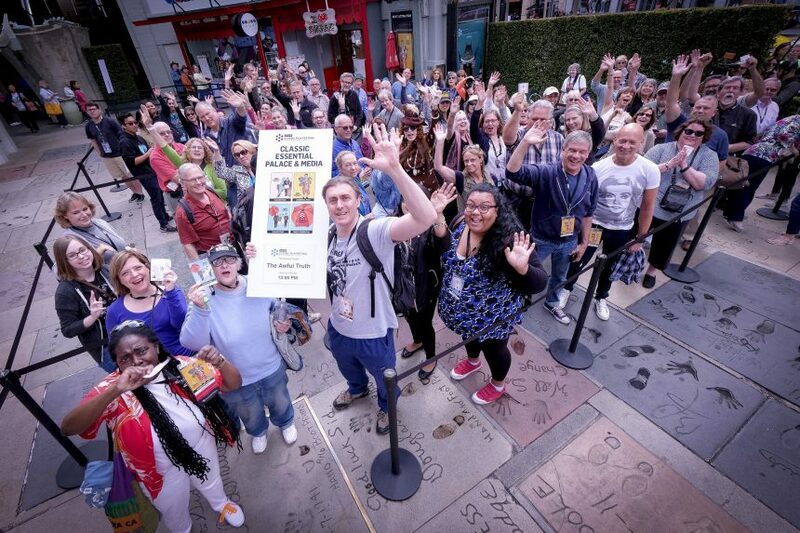 Saturday is always a densely packed day at the TCMFF. It begins with one of the movies I treasure from my nostalgia bank. A comedy takeoff on my favorite film. 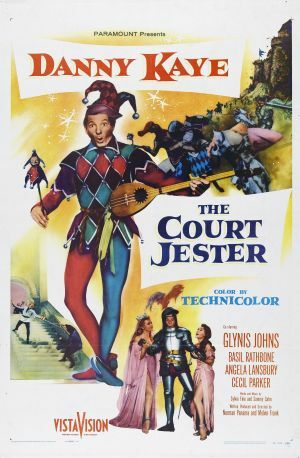 The film features the clown prince of movie comedy from the 1940s and 50s, the amazing Danny Kaye. Like most people my age, I encountered this movie in reruns on Sunday afternoon movie programs. It is a brilliant take off on “robin Hood” and other swashbucklers. The movie looks great on the big screen and this is one of the reasons I chose to see a movie I practically know by heart, because I have never seen it it a theater. The color bursts forth in amazing hues and the costumes look lush and detailed. The opening number with Kaye pretending to be The Black Fox and dancing with miniature versions of himself was a riot. The Foxes outfit was reproduced a dozen times for the diminutive actors playing the acrobatic troop that Hawkins once worked with. Captain Jean shows up in a similar outfit, tailored for a woman and with a slightly different color. This is the start of the little details that make a big screen viewing extra special. The audience was full and host Illeana Douglas and guest Fred Willard shared their stories about seeing the film and loving Danny Kaye. Outside in line for the next film, I encountered a woman who had a myriad of tattoos, but her most recent ones were the focus of my attention. If you look closely you will see here on the wrist a Vessel with a Pestle, a Chalice from the Palace, and a Flagon with the figure of a dragon. She definitely is a fan. 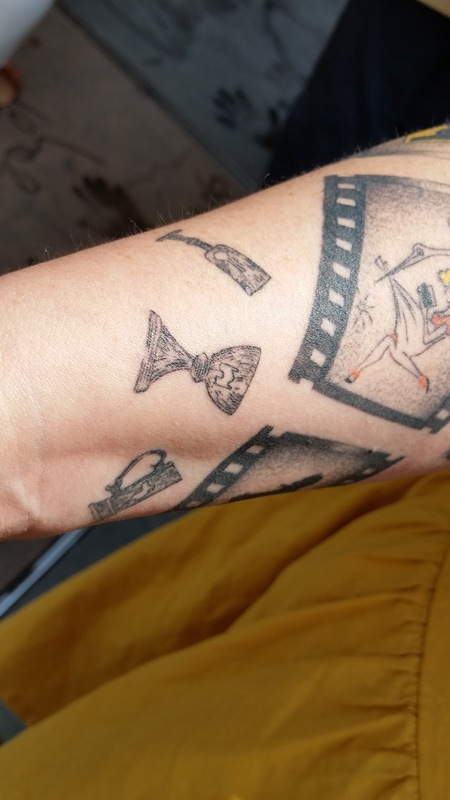 My fandom will not go so far as to paint my body, but I do have a full post on the film here. I think you will find the review and story there worth your trip. something else. My daughter Amanda and I split up at this point and she headed off to see the 70’s classic while I queued up for a screwball comedy that I saw three decades or so before and had only a vague memory of. This was a chance for me to sit with some of the TCM Party People I know from on-line. Kellee Pratt and her husband Gary were there as was Aurora from Citizen Screen. I saved a seat for my local blogging buddy Michael, and there were a dozen others from the group around us as well. Some of those folks were introduced to me and some were not but all of the group was friendly and full of anticipation. The excitement was completely understandable because this movie is a delight. As with most screwball films, the premise is a little far fetched and convoluted but once you accept that, everything falls into place. Cary Grant and Irene Dunne are married couple who have some secrets that they keep from one another but they appear to be a little innocuous. Grant however lets his suspicions get the best of him and they pursue a divorce that neither of them really wants. Ralph Bellamy plays the third wheel love interest who complicates the couples reunion. This is a part that he most have done in films a dozen times, including “His Girl Friday” where again his romantic proclivities are thwarted by Cary Grant. I’d just seen Grant in “North By Northwest” a few days ago, and It is amazing how great his range was. The picture at the top of this post was taken by TCM of the line for the film. If you look closely, you will see me giving the “Fight On” victory salute of my Trojan Family. I saw this movie when it was first released and I thought it was hysterical but a bit of a thrown together piece of work. I must have watched bits and pieces of it over the years so that I knew it intimately. Watching the whole thing once more, it was much more coherent and professionally assembled than I remembered, although it was just as funny 38 years later. 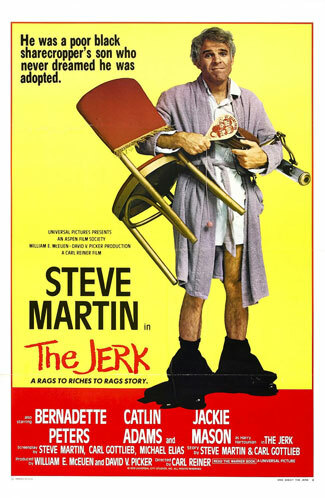 Much of that credit belongs to the director Carl Reiner, who along with star and screenwriter Steve Martin, put together a series of loose sketches (much like they had done throughout their careers) to make a real movie. Reiner was present before the screening for a book signing that went on quite a while and caused a pretty big delay in the schedule. I was worried I’d not make it in time to get to the next film where I was scheduled to reconnect with Amanda. 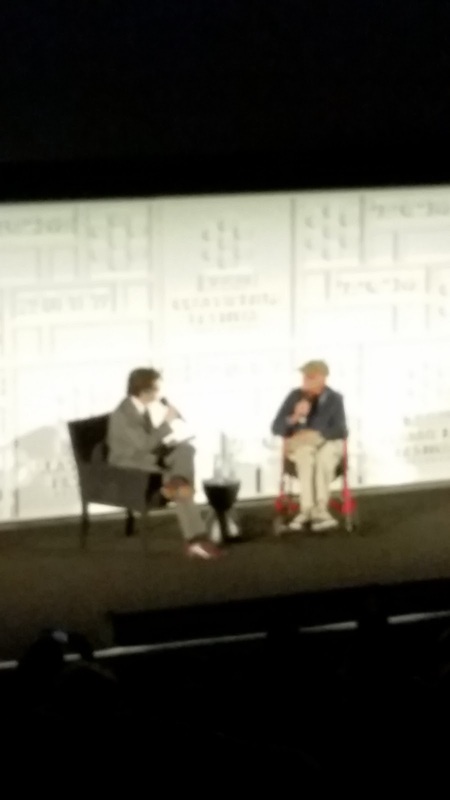 Reiner was much like Mel Brooks was, full of stories and very funny. He does digress a bit into some political themes that are prevalent these days. One of the reasons I want to go to the festival is to get away from that subject matter and it was a little annoying. I was glad when he got the subject off his chest and went back to the film and his admiration of Steve Martin. Host Ben Mankiewicz, while interviewing him had a hard time understanding the baseball cap he had handy. The information that Reiner is not a Colorado Rockies fan, lead to realization that the hat logo had more to do with the guest than baseball. I’ll bet you figure it out faster than Ben did. 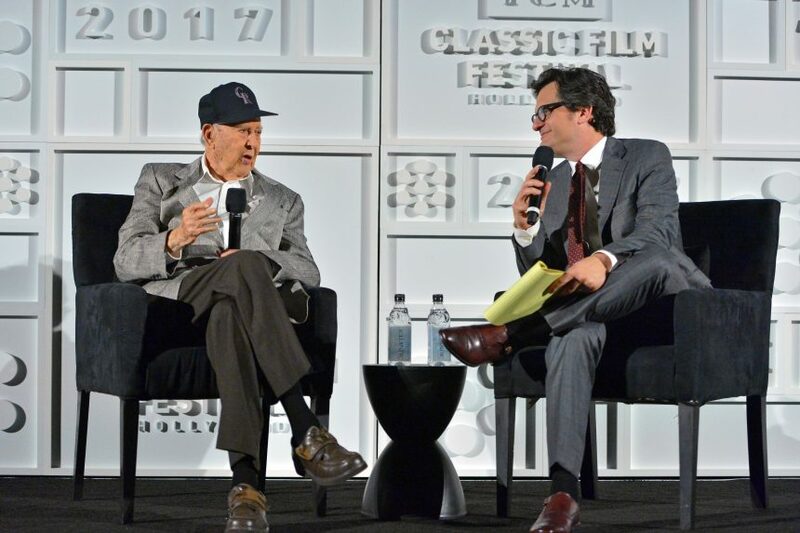 I was Mr. Reiner last year at the TCM FF talking about “Dead Men Don’t Wear Plaid“. At age 95, he has not lost his wit or enthusiasm for working. Apparently he has two other books coming out this year as well. 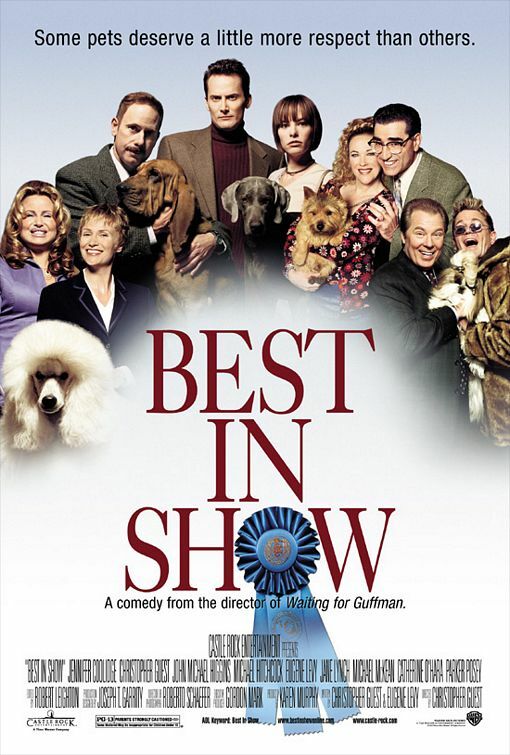 The least “classic” in terms of date released film I saw at the Festival was the most successful of the Christopher Guest directed improvisational films, “Best in Show”. I suspect some classic film fans would be wondering why this movie is included in the program. It is barely seventeen years old and hardly the sort of thing that would attract this audience. It was however not only well attended but completely booked and I don’t think anyone in the standby line got in. Since the theme of the festival was comedy, it makes sense to have some of the funniest movies around included in your program. Since the Festival makes a great effort to add value to the screenings with special guests, this film really paid in spades because there were four actors from the film present to share some stories. John Michael Higgins, Fred Willard, Bob Balaban and Jim Piddock sat down front and spoke of the process that is used to put these ensemble films together and they reminisced about the making of the film. Poor Bob Balaban had such a sore throat that he could not speak, but he participated with notes that the host or one of the co-stars would read. It seems appropriate that he was the one with a wing down since it was also true when they made the film. He had a large footbrace on his leg the whole time that they were shooting and had to have his slacks altered so that he could hide the fact but still wear the piece. Piddock recalled how difficult it was to play straight man to Willard. He also noted that all of their work was basically done in an afternoon and that there were no dogs present at the location where they shot. We had an interesting encounter with a woman in line for the next movie. She had been in the screeing with us and she and her friend were discussing the film while we waited to get back into the main Chinese theater. She hated the film, and I think she represents many of the fans who would have questioned it’s inclusion. However if you judge by the volume of laughter in the room and it’s frequency, the movie was a success with most of the crowd. While it may not be from the studio era that most fans of TCM would use to define “classic film”, the rest of the world would certainly concede that this is at least a modern classic. “The Graduate” introduced Dustin Hoffman to the world and the themes of the movie reverberate throughout Hollywood for ten years after the film was released. As hard as it was for me to believe, my daughter had never seen it and I was anxious to get her take on the film. The Simon and Garfunkel songs that are littered throughout the story are part of the soundtrack of we baby boomers lives. The opening sequence with Dustin Hoffman’s Benjamin, being moved without any effort on his part by the people conveyor at LAX, with the blank tile walls behind him, completely forecasts the characters story and ambivalence. Much has been written about the final shots and the tentative smiles and uncertainty on the actors faces, but if you ask me, this was the moment that Mike Nichols earned his Academy Award. Screenwriter Buck Henry was the guest and his was one of the most interesting interviews of the weekend. Mr. Henry is eighty seven years old and not quite as spry as Carl Reiner or his old collaborator Mel Brooks. He was in fact in a wheelchair, but he did not appear to be infirm. As he was interviewed, there were times when he seemed indifferent to or confused by the questions, but just when you thought he was out of it, he usually made an insightful comment or quip, and I began to think he was really just toying with us. The fact that Robert Redford walked away from the part as Nichols continued to try and interest him in it might be well known. Henry added to the story however by explaining that Redford’s reason given to the director was simple, he didn’t get it. He also shared a piece of info that I was unaware of , Murray Hamilton was a replacement for an actor who Nichols let go. The actor was very capable but Nichols simply did not think he could play “rich”. The actor was Gene Hackman, perhaps my very favorite actor ever. To me the bigger question was how he could play older. Hackman and Hoffman are pretty close to the same age and they shared rooms together at one point. Hackman moved on to “Bonnie and Clyde” which was not at all a bad trade for him. The best part of the film came in the car on the ride home that night. I had the kind of discussion with my daughter that film fans always want to have. We had insights and disagreements and intelligent comments to make about a movie that inspired us. She has asked me several times what my favorite part of the festival was. I’ve not said it before but I will put it in writing right here. My favorite thing about this years TCM Film Festival was the forty minute ride home that night, talking to her about a great movie. 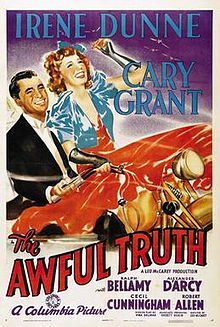 Yeah, The Awful Truth was a delight to enjoy in the Chinese Theatre with some of our blogging friends and a host of fellow movie lovers. Thumbs Up for getting to go to Best in Show and The Jerk, Richard. Just couldn’t go wrong with line-up this year. Lots of tough choices, but I was happy with everything I saw. Including all our friends.